Rev. Joël Spinks is the founding pastor of the Quebec Victory Church, located in Canada’s Eastern Townships. His vision is to reach francophones with the gospel through media. Pastor Joël hosts the Monday-Friday « Vie de Foi » daily television and radio program (produced by EMCI-TV). He also authored books such as « Understanding Divine Healing, » « Jesus Revealed: The Gospel of John Explained » and « Prophetic Light. » He’s been a presiding board member of « Ministères EnseigneMoi / EMCI-TV » since 2010 and he founded Integrity College in 2016, an online college geared towards training believers called to leadership. Pastor Joël grew up in a Christian home in Quebec. He’s also blessed to be a fourth-generation believer and was himself born-again around the age of four. He spent his youth pursuing God through the study of the Holy Scriptures and in his involvement in his local church, the Salvation and Deliverance Church of Canada. At the age of 12, he began teaching Sunday School until he was 18. He also traveled as a Southern Gospel soloist during evangelistic crusades during that same period of time. In 1999, under the banner Joël Spinks Ministries, he recorded his debut album entitled « Let Him be your Refuge » which enabled him to travel in Canada and the United States for four and a half years. Pastor Joël also ministered in North America, the Caribbean, Europe, Africa and Australia. In 2003, he was invited as a guest on « Lifeline », produced at that time by the Miracle Channel based out of Lethbridge, Alberta. Immediately after the recording of this first program, he and his family were invited to join that national media team. The « Lifeline »program was broadcasted on the Miracle Channel (Canada), CTS (Canada), Vision TV (Canada), NRB Channel (United States) and the Australian Christian Channel (Australia). It was in September 2003 that the Spinks family left Quebec to relocate to Alberta. For four years, Pastor Joël served as an associate pastor at the Miracle Channel’s church. He also taught leadership classes at the Miracle Channel School of TV Ministry. In addition, he hosted the bilingual « Seeds of Faith » daily devotional as well as contributed to the « Lifeline » television program until his return to eastern Canada in September 2007. 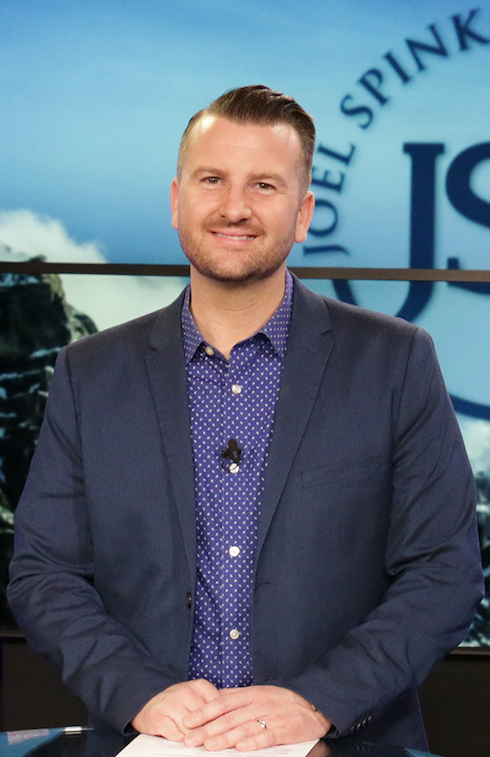 Pastor Joël then appeared on « From the River » (broadcasted on the Miracle Channel, CTS, Vision TV and Cornerstone TV – USA). Following some ministerial trips to the Canadian Arctic, he finally returned with his family to Quebec to establish the Quebec Victory Church in September 2008. It was from the province of Quebec, at EMCI-TV, that he resumed his television ministry. His flagship program is called « Vie de Foi ». At the academic level, Pastor Joël also earned a college diploma from the Cégep de Granby (Granby, Quebec, Canada), the « Evangelistic Trainer Diploma » from Evangelization Explosion (Fort Lauderdale, Florida, United States of America), the « Certificate in Ministerial Leadership » from the Quebec Bible Institut (Longueuil, Quebec, Canada) and finally, a « Bachelor of Theology » from the Saint Paul’s Bible Institute (New York, New York, United States of America). A lover of the Word, he pursues his distance theological studies via the Oral Roberts Ministries (Tulsa, OK. USA). Pastor Joël and his wife Mathilde are the parents of two beautiful young girls, Flora-Mae and Félicité. The Spinks family resides in Bromont, Quebec, Canada.